TWITTER FOLLOWER @SuperStillers: He (Simms) was just anti-Steelers and seemingly on purpose. I think what makes him a total jag is that play with Ike Taylor when the big fight broke out. He was all over Ike for hitting Oher in the head when meanwhile the reply clearly showed Ike getting tripped first. Now don’t tell me when they review other plays they don’t have someone in their ear telling them what to look for. Then he has a chance to reply back and say “hey, rerun that for me so I can use my telestrator thinggie.” Every other play, especially the ones being reviewed officially, they watch at nauseam. But not this one. It was clear Ike retaliated and every replay they showed started at his hit not Oher’s trip. A VERY good PRACTICAL reason, and one of many, to substantiate a Jagoff labeling. Haaaaa.. yep.. THAT’S one we can all put our passion behind. Hey Phil, you probably typically do a good job on OTHER NFL games AND you have great TV hair, but our Steelers played so horrible yesterday that some ‘Burghers actually switched over to watch the Pirates lose (less painfull because we’re back to expecting that). And since it was the FIRST game of the season, we ARE NOT ready to blame any of OUR players or coaches for this “TRAVESTY IN BALTIMORE,” therefore you are going to be the unfortunate target of our emotions. So to Phil McGroin, who has more mousse in his hair than the Alaskan Frontier (get it MOOSE? haaaa) , you had a great game along with Alice, Brittany, Shelly, and the ALL THE OTHER Baltimore Cheerleaders but, before the NEXT game, please take a healthy dose of our famous herbal supplement, called, “Shuthehellup,” Ya Jagoff!!!! All three will be getting one of our SWANKY “Don’t Be A Jagoff” T-shirts featured HERE! 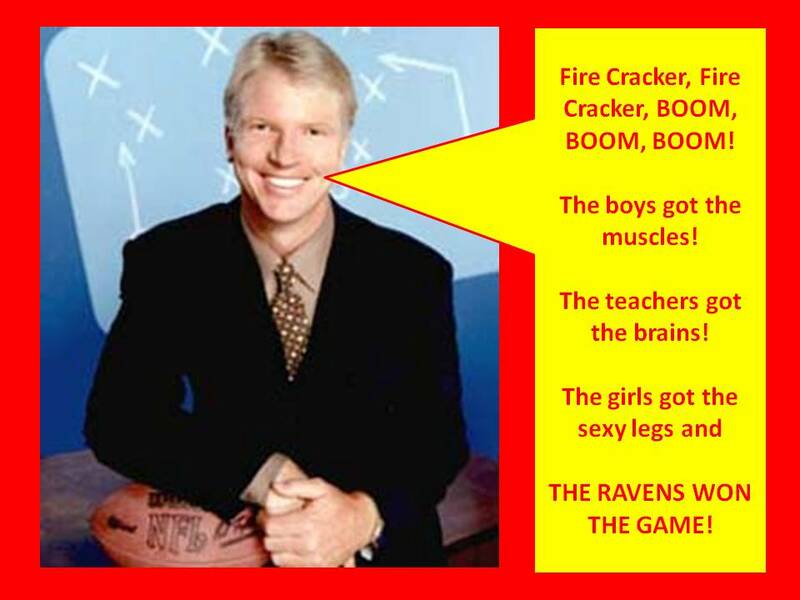 Phil Simms should, just, be happy that he started his career about the time the Steeler Dynasty was ending. Also should be glad that he had a great defense to cover up his career QB rating of 78… And that he retired, just, prior to the Steelers rebounding from those under achieving 1990’s. Dis JagOff had a 55% compilation rating with 199 TD to 157 INTs.